Our attention were drawn to a publication of the Sun Newspaper, Sunday 25th March, 2018 and that warranted this Article; to give a balanced report to the members of public and re-orient some people who may have been swayed by such publication. We presume that the publishers are ignorant of the legal implication; hence this rejoinder. Firstly, we want to say that there are no two parallel Assemblies of God Church with two headquarters. We all know that the Corporate Affairs Commission cannot register two identical names with same objectives under Part C of the Companies and Allied Matters Act. An authority for this principle of law prohibiting registration of two identical names as calculated to deceive members of the public is the case of Niger Chemist Ltd. Vs. Nigeria Chemist (1961) All NLR 171. It is either it is One Assemblies of God or nothing else. AG is not a mushroom church but a Muchroom Church. 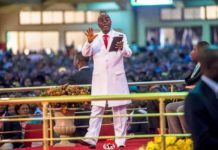 Dr. Paul Emeka, the dismissed and excommunicated General Superintendent of the Church is unknown to Law and the church. The Certificate of Registration of the Incorporated Trustees of the Church does not include his name among other trustees mentioned therein. The present trustees of the church as it appeared on certificate of incorporation of trustees dated 30th April, 2015 include: Rev. Dr. Chidi Okoroafor, Rev. Pastor Ejikeme Ejim, Rev. Vincent Alaje, Rev. Dr. Godwin Amaowoh, Rev. Godwin Idogo, Rev. 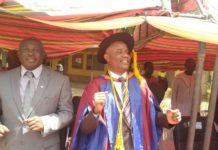 Dr. Johnson Odii and Rev. Dr. John Ikoni. If Paul Emeka claims to be the General Superintendent of the Church nor a trustee, please let him produce any document establishing his claim. The locus classicus is the case of Apostolic Church Ilesha Vs. A.G. (Midwest) (1972) 4 S.C. 150, where the court held that the corporate status of a body is established by the production of its certificate of incorporation. By implication and application, any person or group of persons whether on representative capacity, their heirs, privies, agents and in whatsoever name narrating issues about the church is both misrepresenting, contemptuous and in fact an affront to the rulings of the court as stated above. To this extent, the fake persons whose name appeared in the said publication lacked the legal capacity to tell stories about the church which they don’t belong to nor make any publication in its name. If you have been following us on social media you will discover that Dr. Chidi Okoroafor, the General Superintendent of the church has been attending meetings of the African Assemblies of God Alliance (AAGA), Central Africa Assemblies of God Alliance (CAAGA) and World Assemblies of God Fellowship (WAGF) within and out of the country in a representative capacity as the General Superintendent of the church. Assemblies of God Nigeria is not divided. AG Mortgage Bank, Aba Printing Press and all our Bible Institutions across the federation are intact. Over 90 percent of the Assemblies of God members are intact. For example, in the whole of South West among other zones, there is no single soul following Paul Emeka. We are on one page and not divided into multiple factions. Yes, we may have our internal issues as a family but we are resolving them to see that few misguided sympathizers of the former leader of the church return back to the fold. It is not out of place to have sympathizers whenever anything happens. We still allowed these few sympathizers to worship in some of our church buildings for the sake of peace. We are interested in the souls and do not want to shed blood for any reason. We are an Assembly of Pilgrims preparing people for Heaven. We are not aware that there exist another headquarter of the church anywhere other than the National Headquarters of the Church situate at Plot R8 Ozubulu Street, Independence Layout, Enugu. Change of trustees’ address of business must be effected at the Corporate Affairs Commission as required by the Companies and Allied Matters Act. As of today, there is no such change of the registered address of the church and so if Paul Emeka is hiding at AG church at Chime Avenue, New Haven, he is simply on his own and does not warrant public mention. The use of foul language in the said publication such as “One headed by the new helmsmen (Rev. Dr. Chidi Okoroafor) and another by his presumed predecessor Rev. Dr. Paul Emeka is defamatory, scandalous and condemnatory. AG as an institution today is not and cannot be divided into multiple factions. It does not exist anywhere. The cause of the crisis was not as a result of envy and lust for materialism as alleged by the said publication. The root cause of the crisis resulted from internal disagreement in the church over the management of the internal affairs of the church by the former leader of the church, Paul Emeka. As a result, a body known as “Body of Ambassadors & National Consultative Assembly” made up of businessmen and professionals brought complaints against the maladministration of the Church by the former leader. These complaints bothered on breaches of the Constitution of the Church. It was naturally expected of Paul Emeka as a leader to invite the people and address the issues raised in their letter rather he chose not to sit with them against the advice of the majority of the Executive Committee members. It is antithetical to the majority rule or control of a voluntary organization for the majority of the members to be precluded from being interested in how the affairs of the organization are run and to have no right to complain about any wrong doing in the administration of the organization. The Court of Appeal Judgment of 14/4/2015 at page 91 & 2nd paragraph held that- “It is clear from exhibits PE2, PE3, PE4, PE5, PE6, PE6a, PE6b, PE6c, PE6d, PE7, PE8 and PE9, particularly PE5 and PE6d that it was the way and the mind-set with which the respondent (Paul Emeka) reacted to and approached the complains of maladministration of the church and the wrong doings against him by the Body of Ambassadors and Consultative Assembly that created the crisis that engulfed the church. At page 94 & 2nd paragraph the Court of Appeal held that “The conduct of the respondent (Paul Emeka) in refusing to carry out the 7th October 2013 decision of the Executive Committee he presided over undermined the ability of the Executive Committee to resolve the issue and triggered the crisis. Take note the Executive Committee is the highest policy making body of the Church. It was expected that the former leader, Paul Emeka should take decisions in consultation with the Executive Committee but Paul Emeka disregarded them and that landed him into trouble till date. 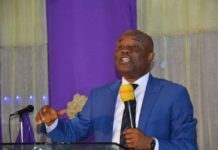 Also take note that one of the sympathizers of Paul Emeka opined that the origin of the crisis as alleged was that Dr. Charles Osueke, former GS of the church did not like Paul Emeka who succeeded him as he was not his anointed successor. This is pure falsehood capable of sending one to Hell. Dr. Osueke is a very holy man and the whole world can attest to this fact. If Dr. Osueke had such intention, Paul Emeka will not emerge in the first place but AG is a church where anyone can get to any height no matter your background. It was this same Dr. Osueke that Paul Emeka is calling all sorts of names that exercised his veto power and reversed the decision of the Executive Committee to suspend Paul Emeka many years ago. If he had any iota of animosity against Paul Emeka, he would have seized the opportunity to strike. Dr. Osueke did not chair the General Committee Meeting of March 6, 2014 because of old animosity which he had for Paul Emeka as alleged by the said publication. Dr. Osueke who is also a member of the General Committee was unanimously selected by the members of the General Committee to chair the proceedings of the meeting. Article VIII, Section 3 (1) (d) – (p) of the 2002 Constitution of the Church established the composition of membership of the General Committee. It provides that the membership of the General Committee shall comprise the following: (d) the General Superintendent, (e) the Assistant General Superintendent, (f) the General Secretary, (g) the General Treasurer, (h) members of the Executive Committee, (i) Trustees, (j) District Superintendents, (k) Area Supervisors/Missionary Area Chairmen, (j) Heads of Schools, (m) Retired General Superintendents, (n) Departmental Heads, (0) one ordained minister and one layman from each District appointed by Presbyters, (p) The General Council Legal Advisers. Dr. Osueke did not impose himself to chair it and the truth remains that he did not attend the meeting to chair it. We believe it was a surprise to him to be selected to chair the proceedings of that day. The Court of Appeal at page 97 of its judgement said that AG Constitution is silent on the question of who chair or preside over the General Committee meeting. It is clearly intended that the General Committee shall select its chairman. Therefore, the General Committee acted accordingly in selecting Dr. Osueke to chair the meeting. The 33% minimum requirement which must be met before calling for the General Committee meeting was satisfied before the March 6, 2014 Meeting as required by Article VIII, Section 3 (2) (e) of the 2002 Constitution of the Church. By the wordings of this constitutional provision, it is clear that 33% of the members of the General Committee can call for Special Session of the General Committee. The General Superintendent in consultation with the Executive Committee determine the terms of the meeting. It is also clear from the above said constitutional provision of the church that there is no provision saying that the GS should convene and preside over the General Committee. The power to appoint who preside over the meeting resides in the members of the General Committee. Again, supposing the church constitution expressly states that he must preside over General Committee meeting, the principle of law encapsulated in the Latin phrase “Nemo judex in causa sua” would have also disqualified him. “Nemo judex in causa sua” means, literally, “no-one should be a judge in his own cause.” It is a principle of natural justice that no person can judge a case in which they have an interest. Paul Emeka is not and has never been close to what we know as “peace”. Since 2014 Rev Emeka has applied violence against church leaders and members with impunity. We can recall that on 20th May 2014 at the very beginning of this crisis, Paul Emeka’s thugs invaded the national secretariat of the church and beat up her national officers who were holding a national executive committee meeting in the office. Many of the officers received various injuries and one of them was forced to jump from the first floor of the building as a result of the ferocious attack of the thugs. Rev Emeka and his followers have consistently maintained such violent disposition ever since. 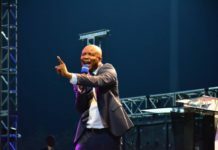 His agents have been responsible for countless attacks on many members and pastors of the church often during Sunday worship. The March 6, 2014 meeting was not held to suspend him but to address the lingering issues raised by the Body of Ambassadors since Paul Emeka could not allow the Executive Committee to resolve it. It was as the meeting was going on, Court Papers filed by Paul Emeka against the Church leaders came into the meeting and that immediately changed the mood of the members of the General Committee who now invoked the Constitution and suspended him. If not for going to court, the General Committee would have simply set up a panel to look into the allegations leveled against Paul Emeka and report their findings. 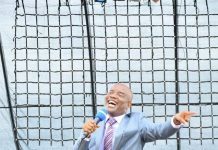 Paul Emeka was suspended and dismissed for violating the Church Constitution which binds on him. He was not suspended because of the complaints brought against him by the Body of Ambassadors. The complaints against him were still pending for resolution while he went to court. It is not enough to say that 4,000 people voted for Paul Emeka to be elected as the General Superintendent of the Church. The same people who gave their votes have also withdrawn their support for him. It is very important to let the members of the public know that the Supreme Court Judgment of 24/2/2017 was in its entirety in favor of the Church. God gave the Church victory. Please for sake of clarity and for any one in doubt please visit http://lawpavilionplus.com and read the judgment of the Supreme Court in full. Just recently, on March 9, 2018 to be precise, His Lordship Justice Liman of the Federal High Court, Enugu Division struck out three legal suits brought by Paul Emeka against the Church. The suits are: SUIT NO. FHC/EN/CS/120/2017; FHC/EN/CS/121/2017 AND SUIT NO. 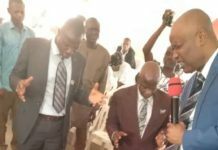 FHC/EN/CS/122/2017: REV PAUL EMEKA V. INCORPORATED TRUSTEES OF ASSEMBLIES OF GOD NIGERIA & 19 ORS. The Church is marching on and the gates of hell shall not prevail against the church. Above all, our greatest testimony is not that the Church won at the Supreme Court but that the Church is moving on to greater heights every day. We are back to the very things that we were known for which is Evangelism. Our motto says, “Preach ye all the Gospel”. In 2015, the Church launched Decade of Rapid Multiplication which will run till 2025. As a result in 2016, we launched a Mission Project known as “Mission Abak” and commissioned 120 missionaries with the mandate to plant a minimum of 50 churches in Abak community. Over 1000 souls have been won for the Kingdom of God. In 2017, we launched another Mission Project known as “Mission Ore” and commissioned 150 Missionaries to plant churches everywhere in that environment. Again, we are holding a city wide crusade from 9-13 May, 2018 in Kebbi State to kick off “Mission Kebbi”. We have graduated our first set of graduates from Evangel University and they are gone for Youth Service. New Courses have been accredited in the University and the students’ population is increasing. We have enjoyed unity as a church at different levels of leadership. So far, we can boldly say the Lord Has helped us and being on our side. Please kindly ask Paul Emeka to point to one thing he has achieved during this period he claims to be the GS of the Church. I think success is the best revenge we have given to him as church against several attacks he has unleashed on the Church. It is false as alleged by the said publication that we had access to our national secretariat with the help of the Military and the Police. After the Supreme Court verdict of 24/2/2017, the leadership of the church was not in a hurry to possess the Secretariat which was turned into a harbinger of thugs. We followed due process of law in repossessing our national secretariat. The Judgment of the court of Law cannot be helpless. The judgment of the court of law cannot be said to lack the inherent power to be enforced. It is a trite law that every successful litigant is entitled to the fruits of his judgment and that is why our National Secretariat Building situate at Plot R8 Ozubulu Street, Independence Layout, Enugu which Paul Emeka was illegally occupying for about 3 years was given back to us. The Military and Police men were simply there to ensure there is no breakdown of law and order. Again, interestingly the repossession of the national secretariat building was a fulfillment of prophecy. Papa Osueke had earlier prophesied that “we shall repossess the national secretariat in his life time.” It came to pass as he had spoken. Praise the Lord! There is no ambiguity whatsoever as to who is the General Superintendent of the Church. Let me take you down the memory lane. Dr. Chidi Okoroafor, the General Superintendent was elected as the General Superintendent of the church during the 39th Quadrennial Council held in October 2014; he was elected President of Central African Assemblies of God Alliance (CAAGA) during the International Mission Conference Held in Lagos late last year; he is an Executive Member of the African Assemblies of God Alliance (AAGA) and an Executive Member of World Assemblies of God Fellowship. Take note the generous olive branch extended by the leaders of the church to Paul Emeka group immediately after the Supreme Court is still open. Many have returned and they received unconditional pardon but some members of Paul Emeka group have stood their ground, contemptuously, in defiance to the order of the highest court of the land. It is indeed a very sad thing and the worst is that every day they go to the media and dish out all kinds of falsehood against the Church. I don’t know what they are set to achieve by this because the Supreme Court cannot reverse itself neither will the church change their constitution. So, they are now set to destroy the image of the church, but they will not succeed. Paul Emeka could not add anything to the church but on daily basis putting effort to destroy her hard earned reputation. The question comes, if you cannot add, why subtract? If Paul Emeka had invested the amount of energy used in fighting the church in promoting it during his tenure, AG would have attained higher heights. The Latin phrase “nemo dat quod non habet” meaning, you cannot give what you don’t have. The simple reason why Paul Emeka is out there with his few sympathizers is that he does not want to submit to the authority of the Church rather he wants to override both the law of the land and the Constitution of the Church. AG is not a respecter of any person no matter your position and that is our Pentecostal distinctiveness. We are different and we make bold to say we are different. The funniest part of it is that they are even the ones that approached the same Court.